By popular demand, our custom made sink cover cutting boards can turn your sink into an all-in-one prep station. Useful for small kitchens, a cutting board over the sink immediately provides a nice sized cutting surface instead of trying to prep meals on a tiny board or surface. In addition, having a cutting board right over the sink makes clean up as simple and efficient after food prep. Our sink cutting boards are made from the exact same commercial grade plastic that we supply to professional kitchens and restaurants. Long lasting and safe for dishwashers, our boards are a perfect choice for your kitchen. Long Side: Measure the sink from the left to the right on where you envision the cutting board. Be sure to note the fractions (such as 36-1/2" or 38-1/4") for an exact measurement. Short Side: Measure the sink from front to back, using the same method as for the long side. Once again, if your cutting board is a drop in, measure 1/4" shorter to be safe. Corners: Recommend Standard corners. For drop-in, we recommend bullnose corner. If you are planning on using your cutting board as a drop-in (as in the board will be recessed or in the sink), we recommend that you subtract 1/4" off your long and short side measurements when you order your cutting board. This is to be on the safe side, to ensure that your cutting board will properly drop into your sink. 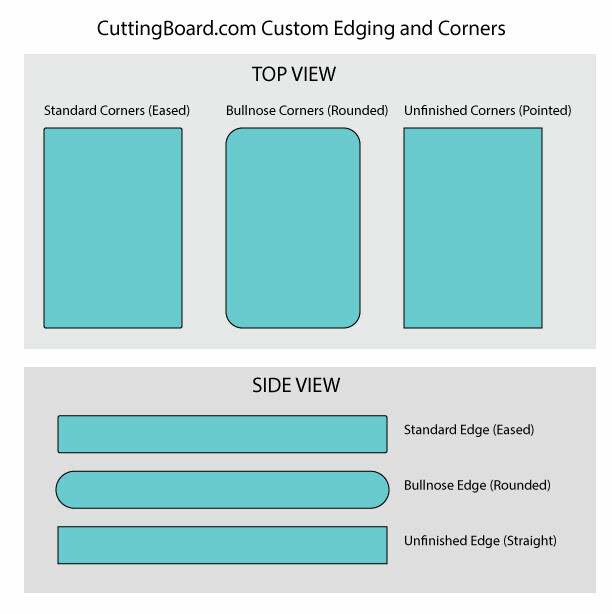 In addition, we recommend a Standard edge and Bullnose corner for your options, as well as a cut out hole or cut service to make it easy to remove your cutting board from the sink. Please Note: While the bullnose corner is recommended, it is not a 'one-size-fits-all' solution. If you need a specific radius for your rounded corners to match your sink, please designate what that size is in your order notes when checking out. You can see instructions for measuring a corner radius in this helpful video. Please Note: For undermount sinks you must have a positive reveal in order to use your cutting board as a drop in. An undermount sink's "reveal" refers to the degree that the counter top extends over the edge of the sink. A positive reveal means the lip of the sink juts out slightly from the edge of the counter top. A negative reveal means the counter top surface overlaps the edge of the sink. If your sink has a negative reveal, there will be no lip for the cutting board to rest on. Click the button below to add the Custom Sink Cover Cutting Board (1/2 inch thick) to your wish list.